This is a rectangular Sunlight Soap porcelain sign. This particular Sunlight Soap sign is very colorful. 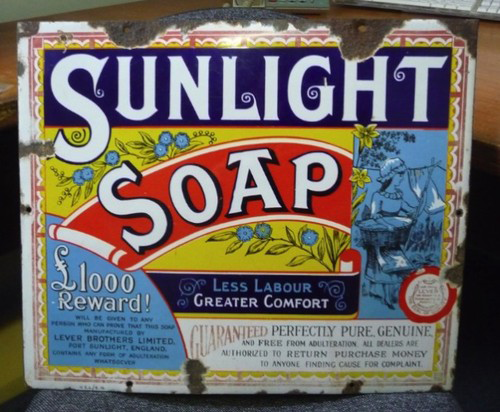 It reads, “Sunlight Soap, Less Labour, Greater Comfort, 1000 Reward! Will Be Given To Any Person Who Can Prove That This Soap Manufactured By Lever Brothers Limited, Port Sunlight, England, Guaranteed Perfectly Pure Genuine and Free From Adulteration, All Dealers Are Authorized to Return Purchase Money To Anyone Finding Cause For Complaint” and features a woman in a cap washing clothes on the right side of the sign.